This weekend is the 19th annual Vashon Island Garden Tour and the island is humming. This much anticipated tour benefits Vashon Allied Arts. Six island homes open their garden gates and welcome plant and garden design enthusiasts on Saturday and Sunday June 27 and 28, 10 AM to 5 PM. For all the details visit www.VashonAlledArts.org. There are lectures by Karen Baer, on Friday night, a sunset garden dinner at the home of landscape designer Daniel Klein with guest speaker Valerie Easton, a wonderful exhibit at the Blue Heron gallery of sculpture by Mike Urban, watercolors by Donna Botten, paintings in oil by Kristen Reitz-Green, and not to be missed, a chamber music concert by world renowned cellists Rowena Hammill and Doug Davis with piano accompaniment by Francoise Regnat. Who could ask for anything more? 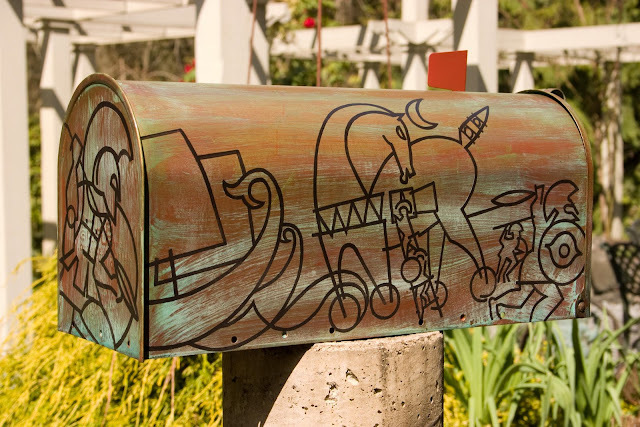 How about a chance to bid on an artist-created mailbox. 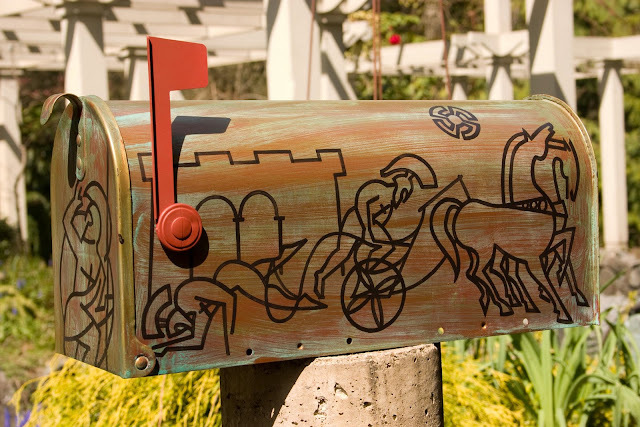 Twenty island artist have turned ordinary mailboxes into works of art. Here is my take on "mail box" titled Trojan Mail or perhaps Trojan Male. I know I will be bidding on the incredible, every square inch is beaded, Snail Mail by artist Sy Novak.